As Muslim riots throw France into a state of emergency, the French government are now seeking to reclaim “No Go Zones” Muslim-dominated and crime ridden neighbourhoods that are off limits to non-Muslims. 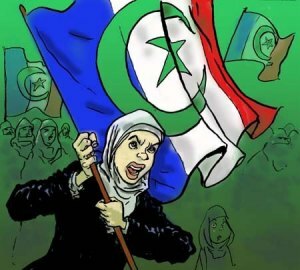 Although many will try and deny it, a low intensity civil war began in France in the Muslim riots of 2005, in the Muslim riots of 2012, French police officers are being shot by the perpetrators. The French government has announced a plan to boost policing in 15 of the most crime-ridden parts of France in an effort to reassert state control over the country’s so-called “no-go” zones: Muslim-dominated neighbourhoods that are largely off limits to non-Muslims. The crackdown on lawlessness in the ZSP is set to begin in September, when French Interior Minister Manuel Valls plans to deploy riot police, detectives and intelligence agents into the selected areas. The hope is that a “North American-style” war on crime can prevent France’s impoverished suburbs from descending into turmoil. The initial 15 ZSP are: Seine-Saint-Denis (Saint-Denis, Saint-Ouen), Paris (Paris XVIIIe), les Yvelines (Mantes-la-Jolie, Mantes-la-Ville), l’Essonne (Corbeil-Essonne), la Somme (Amiens), le Nord (Lille), l’Oise (Méru et Chambly), la Moselle (Fameck et Uckange), le Bas-Rhin (Strasbourg), le Rhône (Lyon IXe), les Bouches-du-Rhône (Gardanne et Bouc-Bel-aire), Marseille (Marseille IIIe, XIIIe, XIVe, XVe et XVIe), le Gard (Vauvert et Saint-Gilles), l’Hérault (Lunel et Mauguio) et la Guyane (Cayenne, Matoury, Remire-Montjoly). Many of these new ZSP coincide with Muslim neighborhoods that previous French governments have considered to be Sensitive Urban Zones. (Zones Urbaine Sensibles, or ZUS) — also “no-go” zones for French police. At last count, there were a total of 751 Sensitive Urban Zones, a comprehensive list of which can be found on aFrench government website, complete with satellite maps and precise street demarcations. An estimated five million Muslims live in the ZUS — parts of France over which the French state has lost control. Consider Seine-Saint-Denis, a notorious northern suburb of Paris, and home to an estimated 500,000 Muslims. Seine-Saint-Denis is divided into 40 administrative districts called communes, 36 of which are on the French government’s official list of “no-go” zones. Seine-Saint-Denis, also known locally as “Department 93” for the first two digits of the postal code for this suburb, witnessed fierce rioting by Muslim youths in 2005, when they torched more than 9,000 cars. Seine-Saint-Denis, which has one of the highest rates of violent crime in France, is now among the initial 15 ZSPs because of widespread drug dealing and a rampant black market. Because, however, the suburb also has one of the highest unemployment rates in France — 40% of those under the age of 25 are jobless — it remains unlikely that a government crackdown will succeed in bringing down the crime rate in any permanent way. Also on the list of ZSP is the department of La Somme, which encompasses the northern French city of Amiens. On August 12 and 13, around 100 Muslim youths in the impoverished Fafet-Brossolette district of Amiens went on a rampage after police arrested a man for driving without a license. Muslims viewed the arrest as “insensitive”because it came as many residents of the neighborhood were attending a funeral for Nadir Hadji, a 20-year-old Algerian youth who had died in a motorcycle accident on August 9. It later emerged, however, that police were called to an estate in northern Amiens after reports that youths were loading fireworks into a car. Police discovered as well the ingredients for petrol bombs, including empty bottles and a canister of gasoline — hence the arrest. In July 2010, Muslim youth in the La Villeneuve suburb of the southern city of Grenoble went on a rampage after police shot and killed an armed robber, Karim Boudouda, who had led police on a car chase after holding up the casino at Uriage-les-Bains, near Grenoble. The rioting started when an imam recited a prayer for the dead man in the presence of 50 Muslim youths who had gathered in a park. One of the youths fired a gun at riot police who were deployed to the neighborhood; the police then opened fire to disperse the crowd — who then went on to torch 80 cars as well as several businesses. It is about time the Weak French govt bring in the military and remove all these Muslims from france. Shame on the french govt & ppl to allow their country to be overrun by these animals. Multiculturalism is a failure in Europe. Now every country is experiencing the threat and encroachment.